This book is very practical in its international usefulness (because current risk practice and understanding is not equal across international boundaries). For example, an accountant in Belgium would want to know what the governance regulations are in that country and what the risk issues are that he/she needs to be aware of. 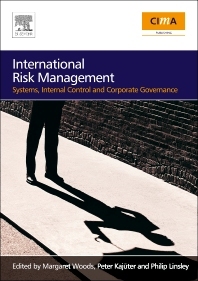 This book covers the international aspect of risk management systems, risk and governance, and risk and accounting. In doing so the book covers topics such as: internal control and corporate governance; risk management systems; integrating risk into performance management systems; risk and audit; governance structures; risk management of pensions; pension scheme risks e.g. hedging derivatives, longevity bonds etc; risk reporting; and the role of the accountant in risk management. There are the case studies through out the book which illustrate by way of concrete practical examples the major themes contained in the book. The book includes highly topical areas such as the Sarbanes Oxley Act and pension risk management. Experienced accountants; heads of internal audit; chief risk officers; non-executive directors and members of boards of directors of all sizes of company.